Malmö (/ˈmælmoʊ, ˈmɑːlmɜː/, also US: /ˈmɑːlmʊ, ˈmælmɜː/, Swedish: [²malmøː] ( listen); Danish: Malmø [ˈmalmøːˀ]) is the largest city of the Swedish county of Skåne County, the third-largest city in Sweden, after Stockholm and Gothenburg, and the sixth-largest city in Scandinavia, with a population of 316,588 inhabitants out of a municipal total of 338,230 in 2018. 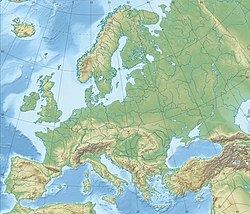 The Malmö Metropolitan Region is home to over 700,000 people, and the Øresund Region, which includes Malmö, is home to 4 million people. After 1971, Malmö had 265,000 inhabitants, but the population then dropped to 229,000 by 1985. The total population of the urban area was 280,415 in December 2010. It then began to rise again, and had passed the previous record by the 1 January 2003 census, when it had 265,481 inhabitants. On 27 April 2011, the population of Malmö reached the 300,000 mark. In 2017 the total population of the city was 316,588 inhabitants out of a municipal total of 338,230. 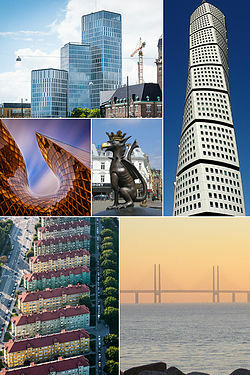 ^ "Malmö" (US) and "Malmö". Oxford Dictionaries. Oxford University Press. Retrieved 1 February 2019. ^ "Malmö". Merriam-Webster Dictionary. Retrieved 1 February 2019. ^ "Malmö definition and meaning". Collins English Dictionary. Retrieved 1 February 2019. ^ "Average Weather in Malmö, Sweden, Year Round - Weather Spark". weatherspark.com. Retrieved 18 March 2019. ^ Larsson, Camilla (7 October 2016). "Malmöfilmen berör – men spretar". Sydsvenskan. Retrieved 10 May 2018. ^ "Malmö Culture". www.triposo.com. Retrieved 19 February 2019. ^ City of Malmö website. "Strandliv: Ribersborgsstranden" (in Swedish). Archived from the original on 18 April 2013. ^ City of Malmö website. "Kulturarv: Ribersborgsstranden" (in Swedish). Archived from the original on 8 August 2011.